This coming-of-age tale drills to the heart of teenage life in a sea-change destination. Jonah and Manx feel invincible one moment and powerless the next when city-types buy holiday homes in their town, effectively emptying the streets of neighbours. When new owners take over the fish and chip shop, their favourite hangout becomes unaffordable. It’s as if they’re no longer welcome in the place they grew up. 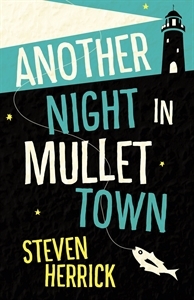 Another Night in Mullet Town is not just a YA tale about best mates, though. It drills to the core of several life truths. People who hold power are not always right but standing up to them involves huge risk. Is there ever a good time to call their bluff? When faced with serious consequences, what would you do to get yourself out of trouble? What if your decisions affected those you care about? With his first sexual encounters, rich and powerful enemies to reckon with and a crumbling home life, Jonah pulls us through his world at speed. Steven Herrick’s knack of crystallising truth in a few words makes each short verse-page a delight. Another Night in Mullet Town is a quick easy read that echoes in the mind long after the book is finished.